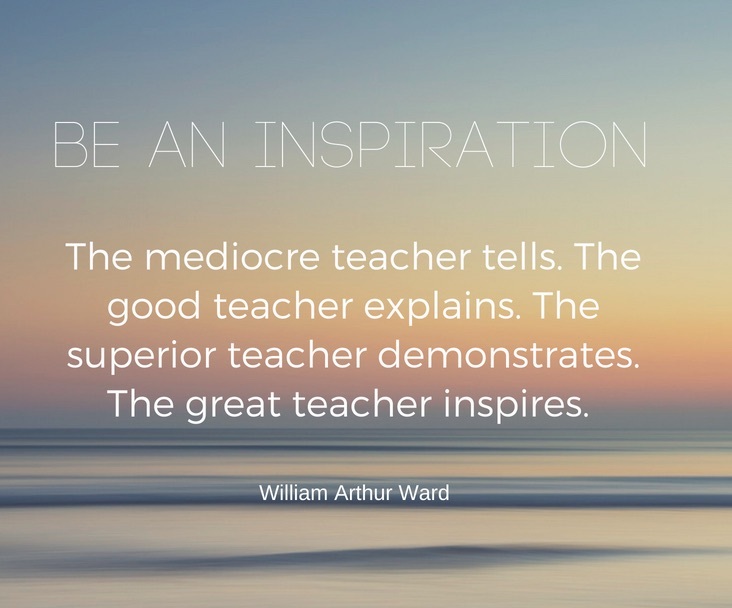 Poetry Friday: Be an Inspiration! I was delighted. I wrote two comments to each one. Kay looks forward to meeting her kids again next week and showing them the comments. I told her that she was doing exactly what I hoped Bayou Song would do, inspire new poems. 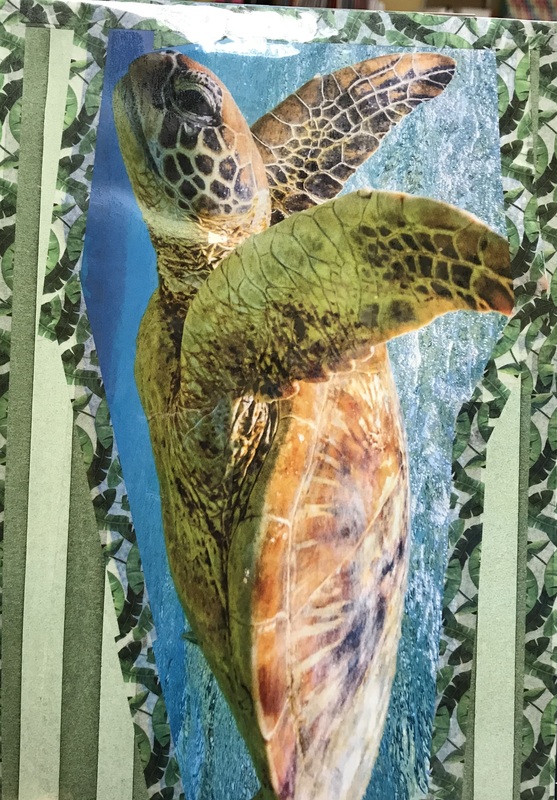 Enjoy these creative response poems! We ducks love the duck pond and warm summers. We like the smell of fresh bread. We never have a bad time at the duck pond. The duck pond opens and all the kids are running. They love to feed us bread and hear us QUACK! The kids also love to hold us fluffy duckies. When the sun started to set everyone was upset. Us full ducks floating around love to sleep. For tomorrow, there is more bread to fill our beaks! I am a wild ocean. Over time, animals with legs have given me a name. Though I do not need one. The winds of earth push my mighty rolling waves. I am located between two areas of land. Which I have benefited for hundreds of years. Please help my fishy friends. They are being hurt by oil. This oil comes from the animals with legs. Many of the sharks are being killed too. Also being killed by the animals with legs. Thousands of offspring from the turtles are killed. On that note, please don’t pollute. My tropical waters are now gray and black. The animals with legs are not to be trusted. They are hurting the mermaids. I will do anything to save my fellow waters. I, the ocean can …… and will. Bayou Song and I are on our way to the National Book Festival in Washington, DC. If you live in the DC area, come to the festival and see me. Bayou Song was selected as Louisiana’s Great Read in the 52 Great Reads for young readers. I’ll be posting pictures to Instagram, Twitter, and Facebook. Take Down the Letters: A play will be presented at Cité des Arts, Lafayette, LA on Sept. 14, 15, 16. I met Sue Shleifer with a mutual friend a few years ago. She’s a writer, and my friend thought we would enjoy meeting each other. At our lunch together, Sue mentioned a box of letters that she had written to her boyfriend over the course of ten years from age 18-28. The box had been sent to her by his widow. He died young at age 50. Sue wanted to create something from these letters, but at that time, she wasn’t sure what. Fast forward three years: Sue has written a full length play that will be presented in mid-September. As part of the grant, she had to give a free writing workshop. She contacted me to assist with the poetry writing session. The premise was very similar to the inspiration for her play: Bring in a letter that you would like to use to write a scene or a poem. After Sue and I met to discuss the workshop plan, I asked Jeff, “Don’t we have some letters from your grandfather to your grandmother in the secret drawer in her desk?” He couldn’t remember, so we looked. The secret drawer is in the top of the desk and can only be opened by pressing a button underneath the drawer in a closed compartment. And sure enough there they were. 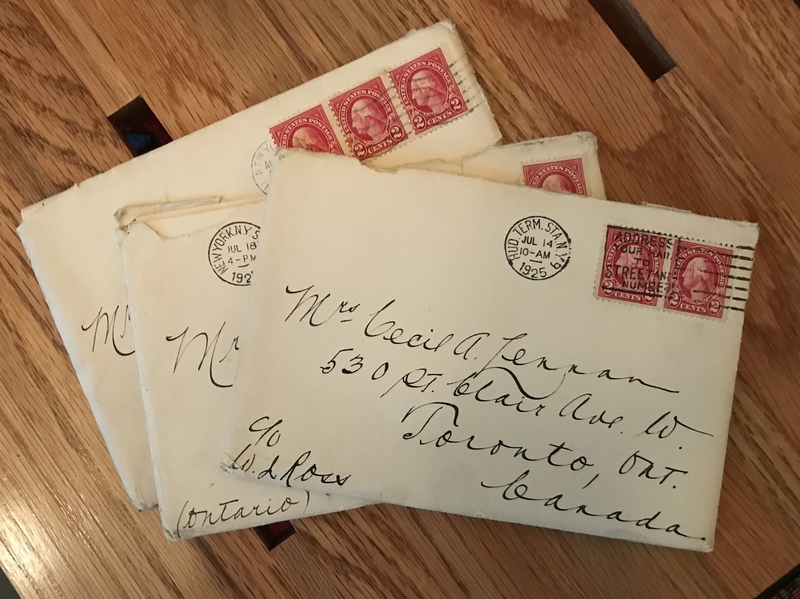 Letters from the summer of 1925. According to my mother-in-law, their daughter, they were married in City Hall in New York City. And shortly after, her mother traveled home to Canada to vacation with her family for a month. C was very much in love, and the letters are romantic. “Probably why she kept them,” Jeff said. Imagine the time period: the only mode of communication was by letter. C wrote pages and pages in fine calligraphy-style handwriting. The one that was most poetic was the last letter of August 8, 1925. In this one, he used a repeated line “Bring back…” I created a poem by finding the poem in his letter. If you come in on the 7:47, bring the bathing suit with you. And bring back yourself even if you forget all of the above. continuously over your left eye. telling me you are mine. the sweetness that is yours. –Margaret Simon (c) 2018 with words by Cecil Lennan, 1925. Poetry Friday round-up is here. Scroll down to link up with inlinkz. Today I am hosting Poetry Friday. What a joy to collect all the poetry goodness in the kidlitosphere. Scroll down to the inlinkz button to link up and to read posts. This summer I participated in the Summer Poem Swap organized by Tabatha at The Opposite of Indifference. 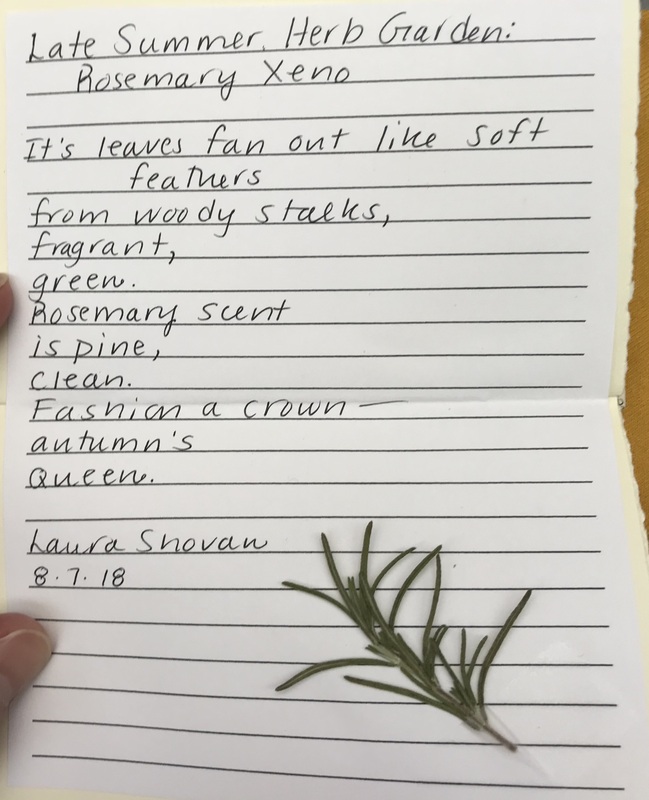 I recently received a delightful package from Laura Shovan, (And it arrived on my birthday! Serendipity!) Laura received one of my books in a blog tour give-away. She made a copy of the “Write it” for writing a zeno poem. The zeno form was invented by J. Patrick Lewis. The syllable count is a mathematical sequence, 8,4,2,1,4,2,1,4,2,1 with the one syllable words rhyming. I was inspired to try my own zeno. Last week Christie Wyman challenged us to write bird poems. I loved Linda Baie’s poem and gathered words from it to create my zeno. Then I made a zine. Zine is a new term for a folded paper mini-book. (See this post that includes videos.) I will be giving a few workshops in September in which we make zines, so I wanted to make a sample Zeno Zine. Morning birds surround me with sound. The beginning of school is a tough time. Learning new routines, establishing a safe space, and getting to know your students takes time. And then there are the directives, the process of finding the way to fit your teaching philosophy into the constraints of district guidelines. I feel the strain. As fun as it is to see those kids you missed over the summer, and to reconnect with faculty friends, the stress can be overwhelming. I can’t hear the words. get to me. I choose to let it be. 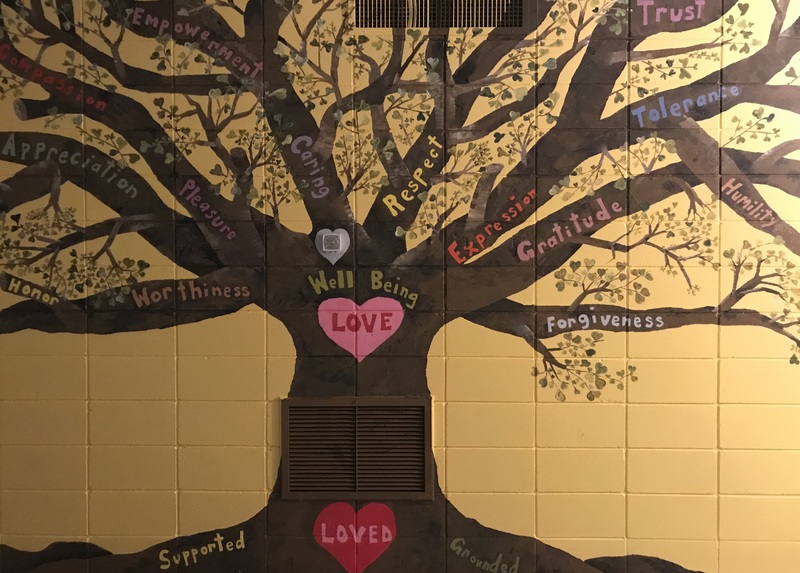 Susan painted this mural in the yoga room. 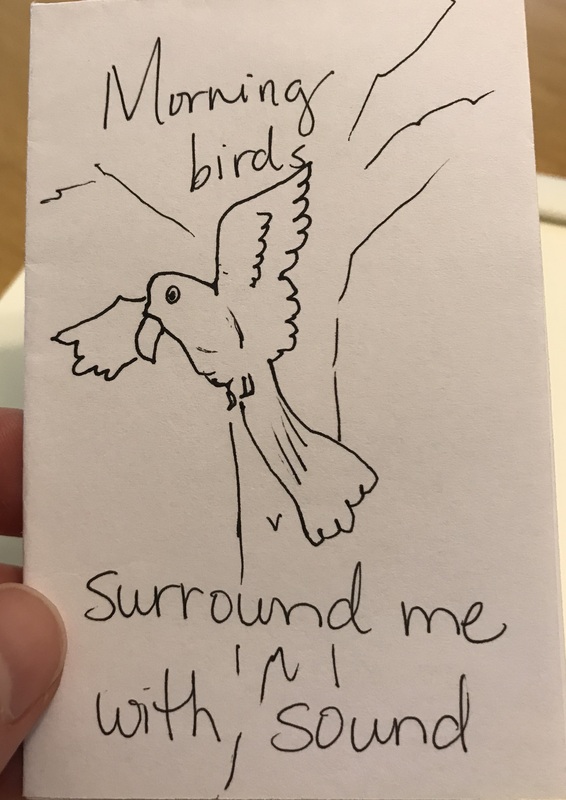 Last week I discovered a challenge from today’s hostess, Christie Wyman, to write a bird themed poem. Just so happened I had attended a poetry reading of Bird Forgiveness by Melinda Palacio of New Orleans. Then I was reading Diane Mayr’s blogpost about a Library of Congress photography show in Los Angeles. She wrote a note to me to check out the featured photograph for “Not an Ostrich.” Diane had seen a Facebook video I had posted of my friend’s goose, who absolutely must be a floradora goose like the one pictured. Diane also challenged us poets to write about a chosen LOC photo. So I am combining all of these things, Bird Forgiveness, bird themed poetry, and poetry about Library of Congress photos, to bring you this poem. Not an Ostrich: ‘Floradora goose.’ Actress Isla Bevan holds a goose at the 41st annual Poultry Show, Madison Square Garden, 1930. Unknown photographer. All things precious, except for this bird, end up buried in a box. 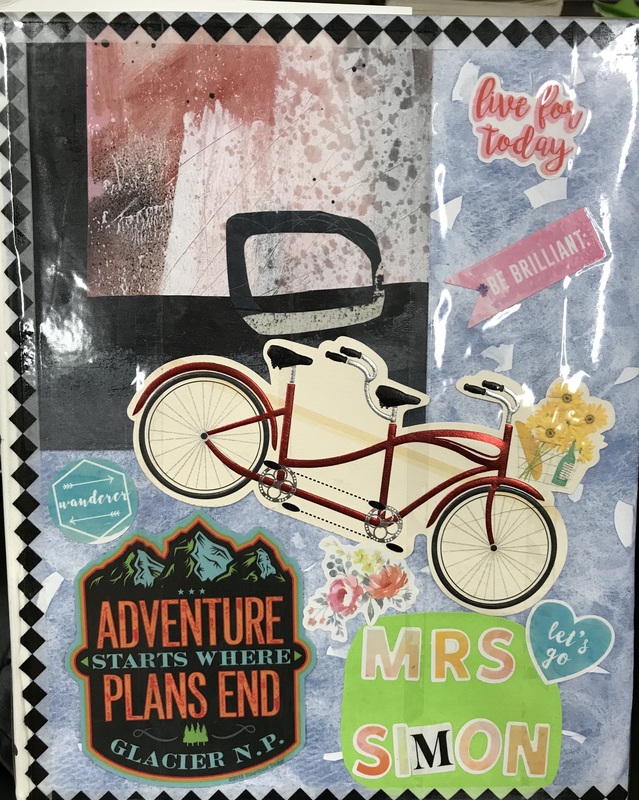 Slice of Life: New Year, New Journals! I saw my students for the first time on Monday. The first day of my gifted class is traditionally the day to decorate your journal. (Some people call them notebooks, but I have always called them journals.) I bring in decorative paper, magazines, stamps, stickers, and this year, washi tape. 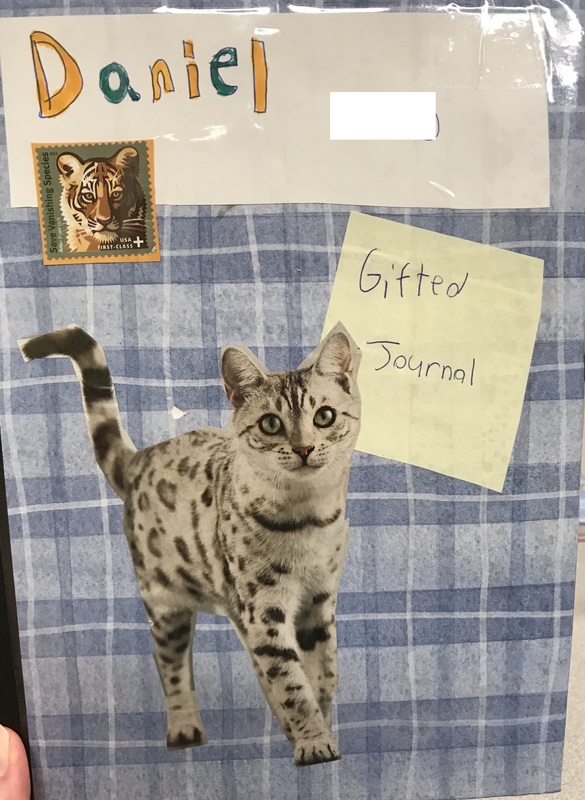 The students have full freedom of choice about how they decorate their journals. I love this as the first day activity for a few reasons. One is it allows us the time to sit around the table and talk casually. I decorate as well, so we are working together. 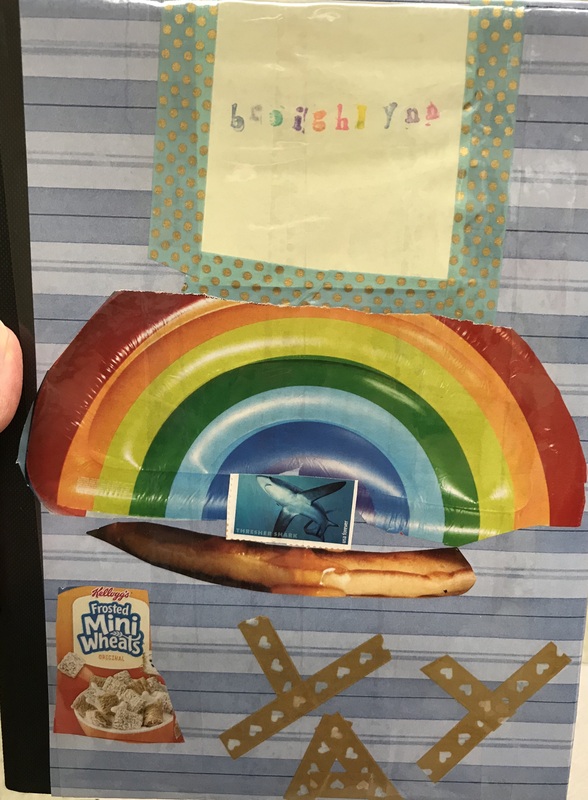 I also love how this simple activity tells me so much about my students, how they work on a project, what interests them, and how they handle creativity. Perfection can be an issue with gifted kids, so this project helps me see these types of characteristics. And also it’s just fun, so kids are excited to come to gifted class every day. My journal for 2018-2019. I incorporated cards and stickers from friends to make my space personal. When a sea turtle is too large for your cover, use it on the back and turn it sideways. 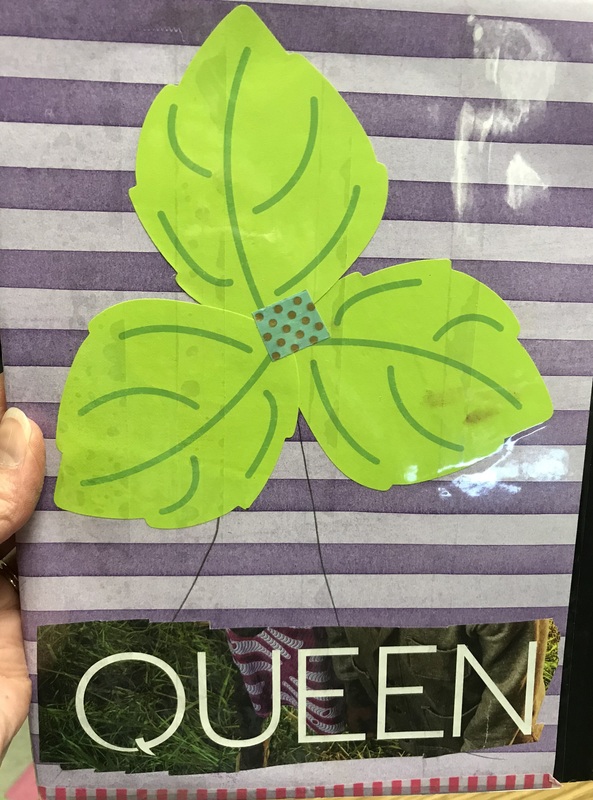 Sticky note leaf shapes become a palm tree for this Queen Writer. Daniel was not discouraged when a magazine cut out didn’t work. He found this cat that he liked much better. There are no mistakes. If this first day is any indication, this is going to be a good year! Poetry Friday round-up is with Molly at Nix the Comfort Zone. School has started here in the midst of hot, humid August. I’m setting up three classrooms at three schools (quite the challenge! ), so lists have become important to me. What do I need at this school that I know I have at that school: tape, markers, glue sticks, etc. The lists go on and on. But lists can also become poems. And in the midst of this stress, a list poem relaxes me. They release stress much like to-do lists do. 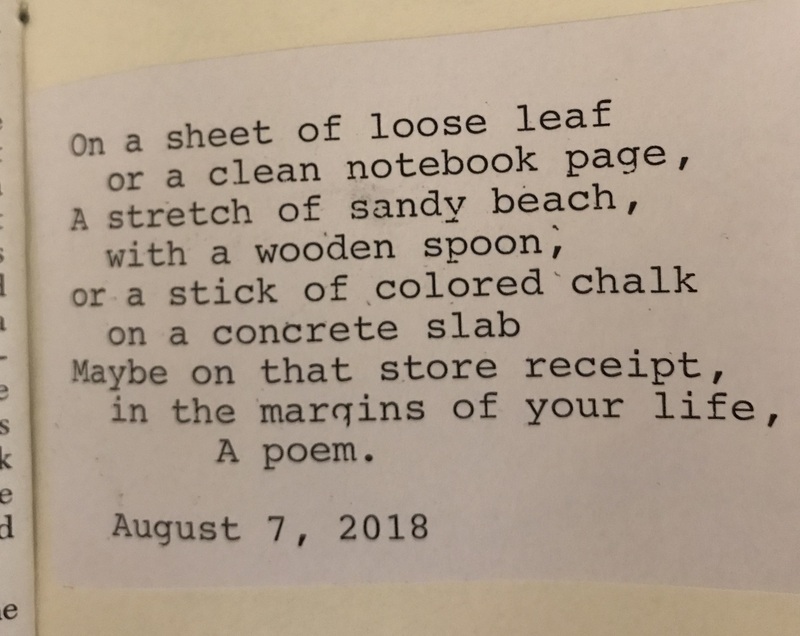 For more list poems, try Georgia Heard’s collection Falling Down the Page or this page on The Poem Farm.